:::Skull Amulet - glossy mixed copper:: This bottom one skull tarkrut is by LP Lek, Wat TamKaoNoi, Phetchaburi Province,Thailand. :::Batch: first batch named "Sarp Mahng Kahng"(a lot of money and properties) ::::Power: This skull is powerful that will support the worshiper fortune and ascendancy. It will make you run business very well and protect you from black magic, bad power, bad spirits and dangers. 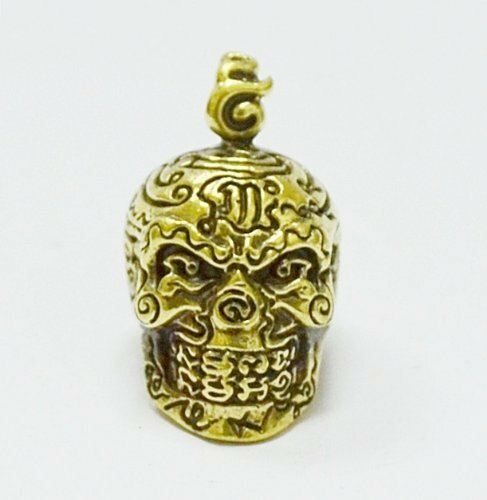 This skull is powerful that will support the worshipper's fortune and ascendancy. It will make you run business very well and protect you from black magic, bad power, bad spirits and dangers.